Various artists: Jack Rivers, The Westerners, Foy Willing & the Riders of the Purple Sage, the Ranch Boys, Tex Owens, Texas Ruby, etc. In the 1930’s and 40’s artists recorded songs on large discs, exclusively for the use of radio stations across the country. It was a way to broaden the artists’ exposure while giving local stations material for eager audiences. Recording these discs was a challenge, because all of the songs on each side had to be recorded back-to-back, with no mistakes allowed. So the artists really had to be in top form during the sessions. This collection of 26 tracks from 16” transcription discs, opens the door to a variety of talent, with songs they didn’t always record commercially, so this may be the first time most of us have heard these renditions. 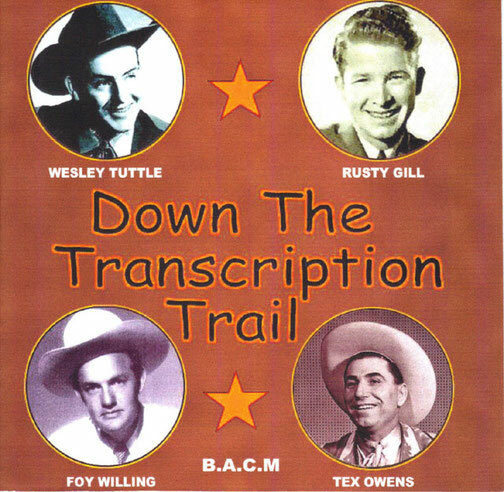 The Down Homers sing the Oliver Drake composition, “Guns and Guitars,” which was also the title of a 1936 Gene Autry film. [Drake wrote songs and screen plays and produced and directed numerous Western films but, interestingly, was not involved in this particular film]. Jack Rivers and his swing band do “Liza Jane,” The Sunshine Girls sing “Dusty Skies,” James Newill sings “Sleepy Hollow,” Red Foley’s wife, Judy Martin, does a fine job on “Give Me a Home in Montana,” Russ Brown & the Cadets sing Smiley Burnette’s “Dear Old Western Skies,” with a “sound” that evokes B-Western films from the 1930’s, Tex Owens (Texas Ruby’s father and composer of “Cattle Call”) sings “Rustler’s Warning” and Jimmie Dean & the Trail Riders (including Wesley Tuttle) do a great, clear rendition of “Song of the Steamboat.” Unfortunately, the audio on the rare “Will O’ the Wisp” is not as clean as one might have wished, but it’s quite good, nonetheless. And there’s a surprise rendition of “Little Sweetheart of the Prairie” by the Ranch Boys! These examples should give you an idea of the cream of the crop, but there’s much more and this CD is highly recommended! Contact VenerableMusic.com, phone (678) 232- 0268.